In 1969, the Lord commanded Apostle Ayo Omideyi to set up Christ Apostolic Church (CAC) in the U.K. This seemed a daunting task especially at a time when he was not eager to live in a foreign land. However in obedience to the word of God, he arrived in London in 1973. In January 1974 he set up Christ Apostolic Church (Bethel) UK the first Christ Apostolic Church in Europe and America. By God’s Divine help the church started in a bedsit at Finsbury Park with his brother, the late Superintendent Pastor O Omideyi, being the first member. The brothers were very enthusiastic about this mission, putting all their time, effort, money and resources into the spiritual and physical growth of the church. Pastor Toluwase, Evangelist Mahama and many others later joined them. 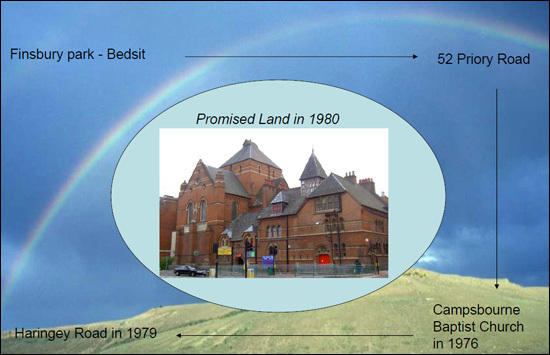 Within a few months of its birth, the church grew too big for the bedsit and they moved to larger premises at 52 Priory Road, Haringey London. With God working in their midst, the news of this first CAC in the UK spread, and the church membership rapidly increased, and yet again they had to look for larger premises. In 1976 this led the church to renting Campsbourne Baptist Church. 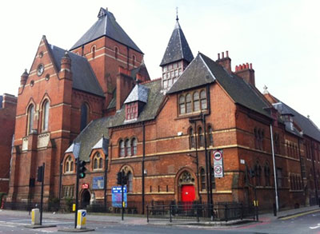 However in 1979, Campsbourne could no longer accommodate them, and they were compelled to hold the church services in the Apostles residence, at 136 Haringey Road, where they had to hold two services on Sundays. Like Joseph, little did Apostle Omideyi, and his flock realise that the scripture ‘everything works for good for those who love the Lord, who are called after His purpose…” (Rom 8:28) was about to be fulfilled. He sought financial help from CAC’ Council of Elders in Nigeria but he was unsuccessful. On his return to London, the Lord assured him the He would provide the required finances. After one year of negotiations over how they would acquire the building, the estate agent gave them an ultimatum of two weeks in which to make the payment. On June 4 1980, the church officially took occupancy of the premises as the headquarter of Christ Apostolic Church (Bethel) UK. Then the word of the Lord came by Haggai the prophet, “Is it a time for you your selves to dwell in your panelled houses, while this house lies in ruins? The challenge thrown out was for the unskilled congregation to rise and complete the difficult task of refurbishing the Nun’s house and the halls of the church premises. There were no builders or engineers amongst the congregation, no electricians no plumbers and certainly no architects, they had to rely solely on the inspiration of the Holy Spirit for skill and ability. God had revealed that he would provide the skills needed to do the work but the question of how to finance the project remained unresolved, despite this, the trusting servant of God and his little flock rose to God’s challenge and started work on June 4. No one was or, wanted to be excluded from the work. The whole congregation worked regardless of age or gender. 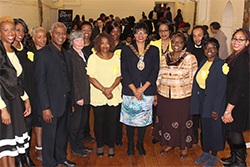 At the instruction of the Lord, while some members carried out the construction work, women took collection cans out on to the streets and raised funds. The funds raised each day was used to buy materials for the next day’s work. The work became a joyful engagement and as the flock worked, they enjoyed a new fellowship with each other and a closer walk with God. 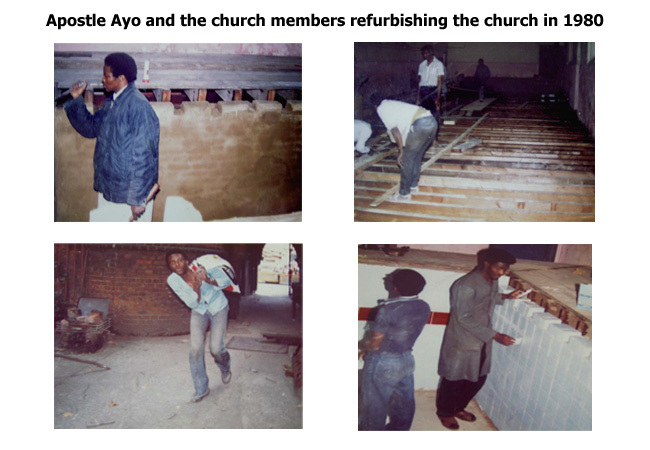 At that time, the majority of the congregation were self-financing students who, trusting in God, gave up their holiday jobs to work on the refurbishment project. To the amazement of those students who gave up their holiday jobs to work for God, that very year, the Nigerian government offered bursaries to students studying abroad for two years. What a faithful God we serve! The challenge was undertaken with joy, with inspired carpentry skills rooms were constructed from wide open spaces, newly obtained electrical skills ensured power and lighting throughout, the gift of plumbing enabled bathing facilities and central heating. 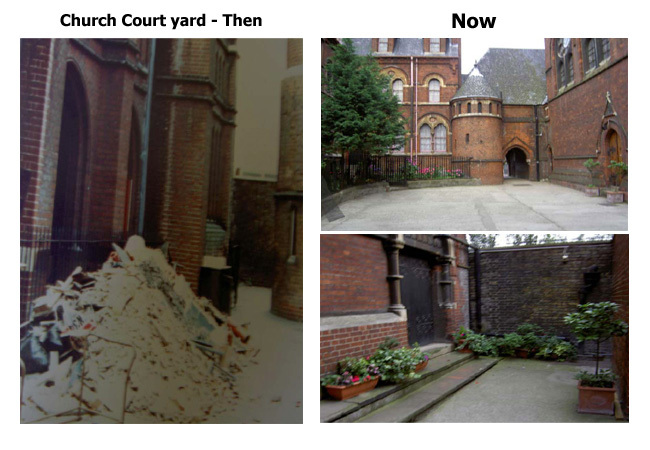 By the time the work was completed the London borough of Hackney commended the church’s self- help effort and a grant was awarded to clean the front walls of the church. Glory to God! To the glory of God the buildings were dedicated in October 1980 with the lower hall being used as the place of worship. 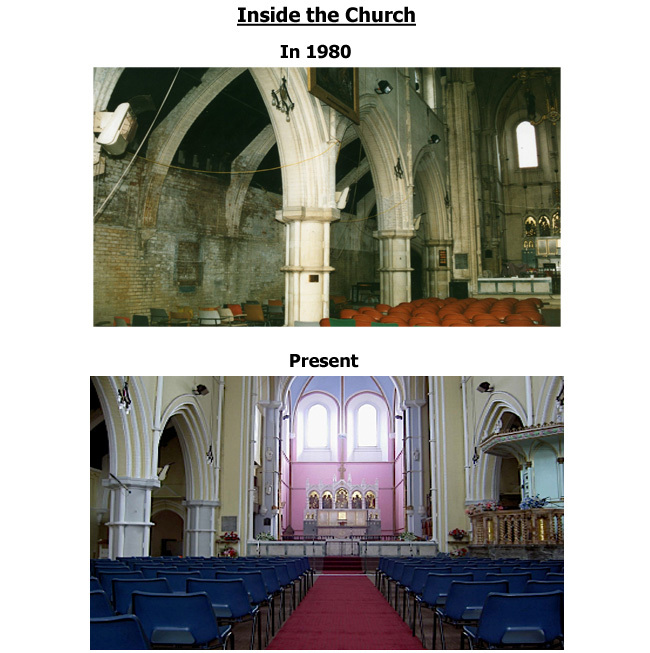 In 1980 refurbishment works started on the main church building that had been derelict for 24 years. Again, the faithful members, motivated under the leadership of the Apostle, set to work under the inspiration of the Holy Spirit’s skill and ability. 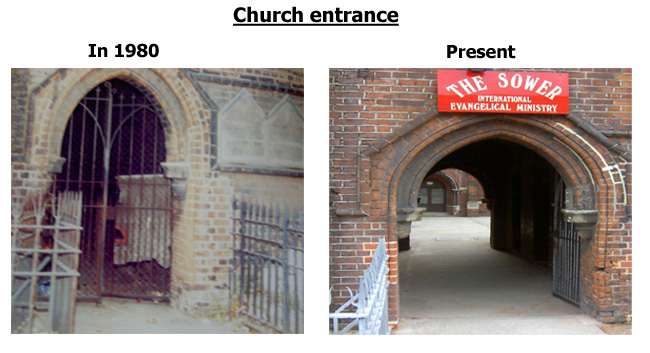 From bare brickwork walls, the church was refurbished and decorated to the glory of God. Again God in his faithfulness provided finance in miraculous ways for its completion. The church was dedicated in Nov 1989. Is the name of the Son of God, The Messiah who has been with God from the beginning and who came to the world as “Jesus” in order to save His people from their sins. Christ is the only way to God and is the risen Jesus; conquering, all powerful, and caring Lord of all. While the name ‘Jesus’ depicts His payment of the penalty of death for human sins, the name ‘Christ’ shows the triumphant power of His resurrection and the promises and power which His resurrection brings within the reach of all His believers. In His own words, He said, after His resurrection in MATT 28:18-20 “All authority in heaven and on earth has been given to me. Go therefore… ” It is that authority that enables the Church (His believers) to do things in His name. Apostolic depicts our use of the techniques used by the Apostles in Acts of the Apostles and as revealed by the Holy Spirit from time to time. They are also skilled master builders of God’s field and buildings. Peter the foremost of the Apostles, built on that Rock and that Stone which the other builders rejected – the very stone that has become the Head of the corner. Paul also continued laying the foundation (1COR.3:9 – 15 ) We must therefore build as the Apostles built with due care and attention. A church is an assembly of sinners in various stages of being spiritually cleansed coming together in order to claim the forgiveness for which Christ died and rose. At Bethel, Jacob met God who changed his name from Jacob to Israel and further more, in response to his request, made him an everlasting promise. When the promise had been fulfilled, Jacob returned to Bethel to worship Him in thanksgiving. The Bethel is an addendum to link the Old Testament promise with the New.. This then suggest that, anyone making a vow before the Lord in this church, is heard and answered in the same way.